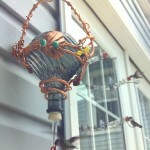 Bill Merritt, doing business as Ozarklake Distinct Décor, makes copper garden art in his studio north of Camdenton, MO. 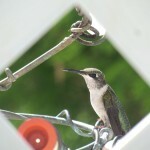 His specialty is hummingbird feeders but his body of work includes various garden items. The glass he uses in his art began life as something else—soda bottles, vases, candlesticks, gazing balls, decanters, decanter tops, bowls, platters, and some glass that even Bill can’t identify. 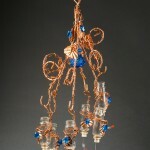 From common to elegant, each is united with copper and repurposed as a fun and functional one-of-a-kind work of art. Bill spent over 40 years in Naval aviation and electronics before his retirement from the Boeing Company. Along the way he obtained a BA in history and an MA in Computer Systems. 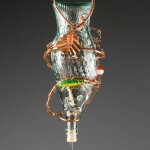 Formerly a draftsman and sometime sketch artist, Bill was quickly led to a functional art that is not only different but serves a purpose and gives new life to recycled copper and glass. 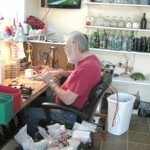 Many years as a professional wireman have translated into bending, forming, and manipulating various and multiple gauges of copper wire, from very thin to tubing size, around glass containers of all shapes and sizes. 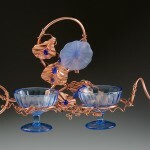 Joints are soldered, copper and/or glass accents are added, and functional art is created. 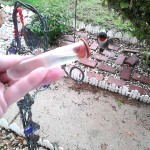 Hummingbird feeders include the bottle-type, with a rubber stopper and hand-formed feeding tube, and delicate multiple-station tube feeder arrangements. 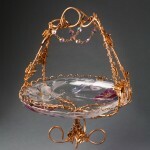 Each piece is one-of-a-kind with its own personality. 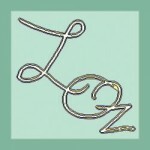 New items are created as the materials and artistic mood dictates. 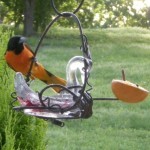 Bird baths, butterfly dishes, oriole feeders, seed feeders, fruit feeders, plant waterers, shepherd’s crooks—you just never know what will emerge from Bill’s studio. But you can always find copper in one form or another, and you’ll have fun identifying the glass containers that find a new purpose in his hands. Bill and his wife live near Camdenton, MO. 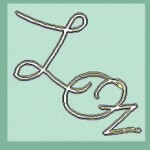 They exhibits at art shows, garden festivals, and birding festivals throughout the country.